Nokia Wireless Charger DT-10W is a nice little wireless charger that wasn’t announced as Nokia 9 Pureview at MWC2019 but was intended to widen the list of the official accessories for this device. I had a chance to play with it at the pre-MWC19 Nokia event, and I must say it looks great. It reminds a bit on DT-601 wireless charger since both have a similar form. 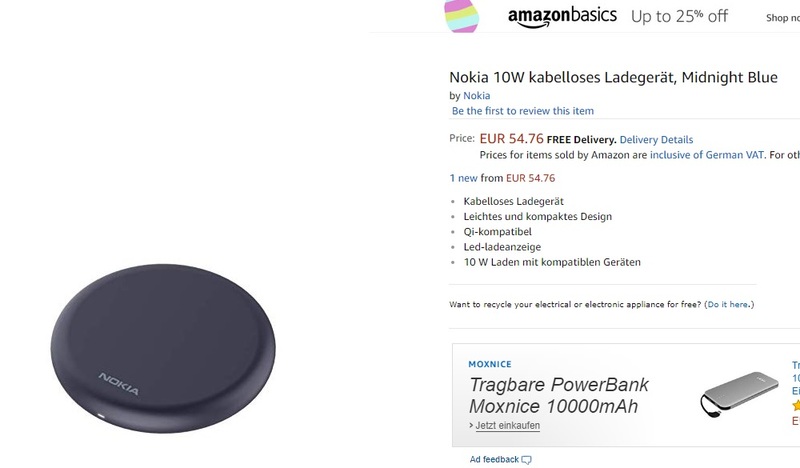 Nokia DT-10W seems to be available now over Amazon.de for €54.76. The delivery details of the charger are a bit off since it says that it is shipped (or dispatched within one or two months. Probably that detail is going to change soon. For now, users of Nokia 9 PureView and Nokia 8 Sirocco can use this little charger. If you are interested in this charger, take a peek at our hands-on video, and for more photos click here.